Well its that time again, My annual October Monster Challenge has begun. The nature of this event is to share various monsters around the world and to improve on my own artistic ability.This is my fifth year in continuing my personal event, so let's get started. The Strix, is not only a Greek/Roman word for owl, it is also about a cursed monster in mythology. The story tells of the mother Polyphonte and her two sons, who were punished for their cannibalism by being turned into animals, with Polyphonte turning into the Strix. The Strix curse causes her to be the creature "that cries by night, without food or drink, with head below and tips of feet above, a harbinger of war and civil strife to men" that now looks like her devious actions. The word carries over with the term stirge and shares ties with the strigoi vampire and the striga witches. 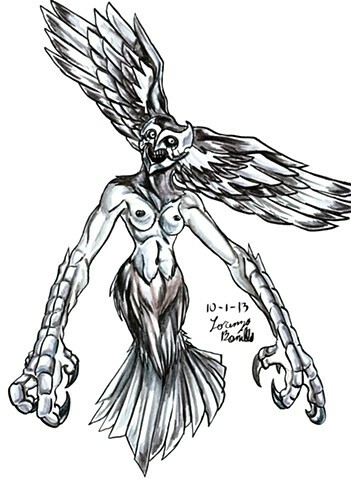 For my creation of the Strix, I based the main features from a monster design from the Persona series, where her arms are the talons, the wings attached to the head, and her legs being the tail feathers. I made her arms into more bird-like talons. I then made the head look like it is wearing a bone helmet, while making shadowed eyes and teeth to display the monster within. This one went through various revisions and my schedule for it did not go off with a good start, due to train delays and outside factors, but the task is to improve and persevere, so I shall just soldier on my big event. Thanks for checking it out and be on the lookout for future designs.